Shopping with Patchwork hobby art is safe. 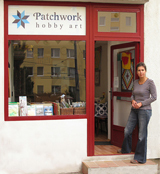 Controller of the Patchwork Hobby Art online shop protects all the personal data within the meaning of Regulation (EU) 2016/679 of the European Parliament and of the Council of 27 April 2016 on the protection of natural persons with regard to the processing of personal data and on the free movement of such data (General Data Protection Regulation or “Regulation”) and within the meaning of Law No. 18/2018 Coll. on Personal Data Protection (“Law”). Notification obligation of a Controller. ID: 36 926 736, I am not a VAT payer. Natural person (“controller”) registered in the Trade register of the Bratislava District Office from 29 June 2005, Business License No-2005/29973/2/Z63. Trade Register No.104-18512. As a data subject, you may contact Mrs. Dagmar Méresová with your comments or requests regarding the personal data processing. It can be done in paper format or in person in physical location at this address: Hany Meličkovej 4, 841 05 Bratislava, from Tuesday to Friday during opening hours (from 14:30 to 18:30), tel. contact: ++421903 212 356, E-mail: patchwork@hobbyart.sk. Controller hereby declares, that she is the only person, to have access to personal data of the customers, which are contained in the online shop (electronic commerce) database, and is responsible for the protection and handling them under the Regulation. Controller declares, that all the personal data provided by customers (name, surname, delivery address, telephone numbers and e-mail address) are considered confidential, and will be collected and processed only for the purposes of conclusion of the contract with a customer remotely by the controller's online shop. The legal basis for processing the personal data: The processing of personal data is necessary to perform the contract, to which the data subject (customer) is a party. Controller of the online shop also declares, that the personal data of a data subject (customer) are not provided to any third parties, except for the personal data needed for shipping (name, surname, address, telephone number and e-mail) via Slovak Post office or courier company, and the personal data processing for accounting purposes. A Controller maintains the customer's personal data for the period of 10 years, following the year in which the contract of sale has been concluded, within the meaning of Law No. 431/2002 Coll. on Accounting, as amended. As a customer (data subject) you have the right to request from the controller access to and rectification or erasure of personal data or restriction of processing concerning the data subject or to object to processing as well as the right to data portability. 1/ The data subject has the right to obtain from the controller confirmation as to whether or not personal data concerning him or her are being processed, and, where that is the case, access to the personal data. If the controller processes customer's personal data: Upon request (from a data subject) the controller will provide a copy of the personal data undergoing processing. The first copy is free. For any further copies requested by the data subject, the controller may charge a reasonable fee based on administrative costs. Where the data subject makes the request by electronic means, and unless otherwise requested by the data subject, the information shall be provided in a commonly used electronic form (via e-mail). 2/ The data subject has the right to obtain from the controller without undue delay the rectification of inaccurate personal data concerning him or her. Taking into account the purposes of the processing, the data subject has the right to have incomplete personal data completed, including by means of providing a supplementary statement. - The personal data have been collected in relation to the offer of information society services to a person under the age of 16. Upon a request from a data subject, the erasure of the personal data of a data subject shall be carried out without excessive delay by a controller. A data subject will not have a right to the personal data erasure when further processing is necessary for the establishment, exercise or defence of legal claims. - The data subject has objected to processing on the basis of the eligible entitlement of controller, pending the verification whether the legitimate grounds of the controller override those of the data subject. If the data subject requests the restriction of processing his or her personal data, the controller will not process any data concerning him or her, except for the maintaining such data, without the consent of the data subject. 5/ The data subject has the right to data portability, which means to receive the personal data concerning him or her, which he or she has provided to a controller in a structured, commonly used and machine-readable format and have the right to transmit those data to another controller without hindrance from the controller to which the personal data have been provided, when the personal data were obtained on the basis of consent of a data subject, or under a contract and the processing is carried out by automated means. - Personal data are processed for scientific or historical research purposes or statistical purposes. The controller will consider the statement of objection within a reasonable time. The controller shall no longer process the personal data, unless the controller demonstrates compelling legitimate grounds for the processing, which override the interests, rights and freedoms of the data subject or for the establishment, exercise or defence of legal claims. As every customer (or a data subject) you have right to lodge a complaint with a supervisory authority, which is the Office for Personal Data Protection of the Slovak Republic, Hraničná 12, 820 07 Bratislava 27. Your personal data are necessary to conclude a contract between you and a controller. In a case where a person concerned (i.e. data subject or customer) will not provide his personal data (name, surname, telephone number and e-mail) to the controller, the contract cannot be concluded (thus no goods or services required by a customer can be delivered). In case of any additional requirements or uncertainties, please do not hesitate to contact a controller via this telephone number: ++421903 212 356. Personal data of our customers are protected by the safe and encrypted "https" connection, which is certified by an SSL certificate - your personal data are thus protected by SSL (Secure Sockets Layer) technology against abuse at all times. The shop system is registered with The Office for Personal Data Protection of the Slovak Republic. Registration number: 201413904.